Analyzing books with qualitative and quantitative text complexity measures. 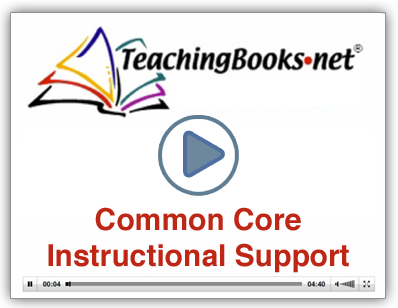 Here are 4 instructional shifts that TeachingBooks.net directly supports. Expose students to a true balance of informational and literary texts with exceptional, teacher-selected titles. Identify titles from the booklists found in each "grade level band" on the left. Goal: 50 - 80 % of texts all students read is informational. Provide teachers in all content areas exceptional, teacher-selected texts with varying complexity and rigor. Identify titles from the booklists accessed by "grade level band" on the left. Goal: all students are exposed to a range of text types, formats, cultural perspectives, and authoritative information outside of ELA and within history, science, social studies, and the arts. Support students' evidentiary argument skills both in conversation and in writing to assess their comprehension of a text. Have ready-to-use questions about books that require students to reference the text in their answers. See the "Book Guides & Lesson Plans" found within each title on specific booklists accessed by "grade level band" on the left. Goal: students use direct evidence of text, in lieu of personal reflections, in building evidence-based answers about studied text. Enable students to hear directly from award-winning writers about their development of ideas, use of language, organization of story, and research experiences. Have "Meet-the-Author Movies", "Meet-the-Author Book Readings", and other author interviews found within the titles on each booklist accessed by "grade level band" on the left. Goal: Students expand writing and research skills by learning directly from the experiences of professional book creators. the Council of Chief State School Officers' (CCSSO) Navigating Text Complexity resource page.